The gyroscope sensor measures the rate or rotation in rad/s around a device’s x, y and z axis. 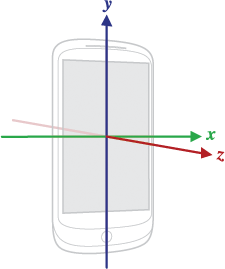 Rotation is positive in the counter-clockwise direction; that is, an observer looking from some positive location on the x, y or z axis at a device positioned on the origin would report positive rotation if the device appeared to be rotating counter clockwise. This is the standard mathematical definition of positive rotation and is not the same as the definition for roll that is used by the orientation sensor. Aware_Preferences.STATUS_GYROSCOPE: true or false to activate or deactivate accelerometer sensor. Aware_Preferences.FREQUENCY_GYROSCOPE: non-deterministic frequency in microseconds (dependent of the hardware sensor capabilities and resources). You can also use a SensorManager sensor delay constant. Gyroscope.ACTION_AWARE_GYROSCOPE: new data recorded in provider. Gyroscope.EXTRA_DATA: the recorded data, as ContentValues. Gyroscope.ACTION_AWARE_GYROSCOPE_LABEL: assign label to the recorded data. 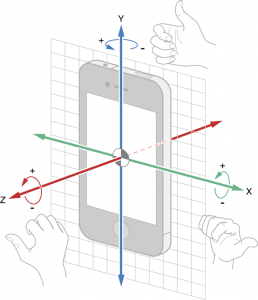 A gyroscope measures the rate at which a device rotates around each of the three spatial axes, as shown in Figure. For more detail information, check the official iOS’s Motion Event documentation.